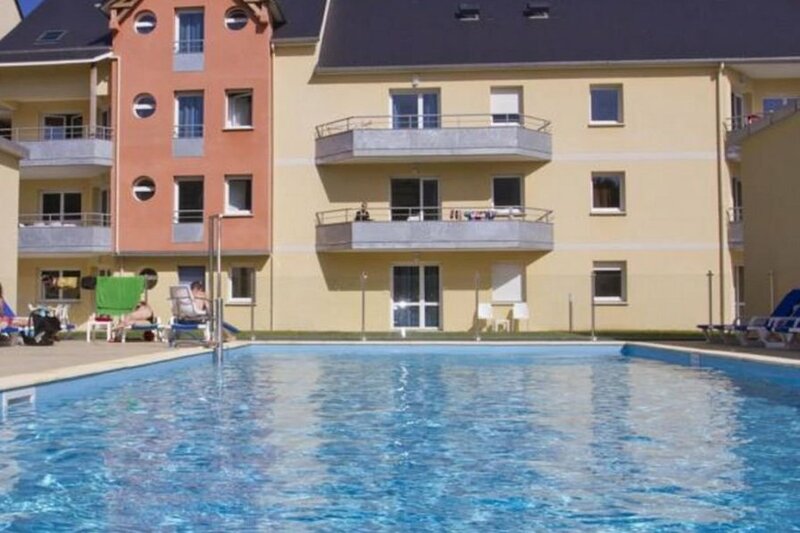 This 1 bedroom apartment with swimming pool is located in Grandcamp-Maisy and sleeps 4 people. It has WiFi, parking nearby and a gym. 2-room apartment for 4 people, 30 m2, modern and cosy furnishings. Living/dining room with satellite TV and dinette. Smoking not allowed. Internet (Wireless LAN WLAN). 1 double sofa bed. * Phone (only incoming calls), hair dryer..
Modern, cosy residence "les Isles de Sola Grandcamp / T2", renovated. Washing machine (shared use), tumble dryer (shared use, extra). In the centre, on the beach. * Some other apartments in the same holiday home are for rent.. The agent describes this apartment as a family friendly holiday rental ideal for the summer holidays. It is also good value for money. The apartment has a swimming pool and is located in Grandcamp-Maisy. The nearest airport is 56km away. It is set in a convenient location. The apartment has free wireless internet. You can also park on-site at no extra charge. The apartment is well equipped: it has a microwave, a telephone, a washing machine and a TV with international channels.